Forecast performance reporting is an important part of public sector accountability requirements. It establishes the base at the start of the year against which performance can be measured and reported at the end of the year. 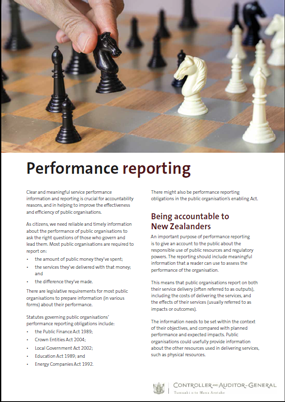 Public organisations should have a clear performance reporting framework in their forecast reporting. The framework should reflect the high-level goals, the impacts the organisation is looking to have, what it is planning to provide (covering all significant services), and what resources it will apply. A well-designed framework will clearly demonstrate the rationale for, and relationships between, its different components. its operating environment, the challenges this presents, and its immediate priorities.